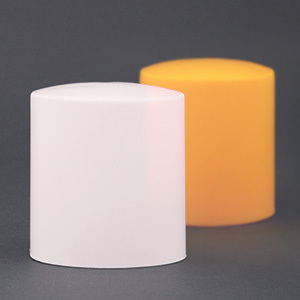 High-visibility REO safety caps are designed to cover the ends of sharp bars. Without these products, those pointed ends could pierce someone’s skin, or perhaps even impale a site worker. It only takes a momentary loss of balance, after all, then a falling individual is stabbed by a spear-like bar. Semi-capsule plastic caps prevent such calamitous events. They’re plainly invaluable site assets, but what other benefits do these products enjoy? The best way to avoid an accident is to be aware of the injurious nature of any particular work scenario. REO plastic caps aren’t manufactured from matte black polymers, they’re cleverly engineered from brightly hued materials. The yellow, tomato-red, and white plastic toppers look slightly unnatural against the reinforcing bars (REO bar or rebar) posts that they’re blunting, so even a daydreaming visitor can easily spot their outlines. Tough metal caps are prone to corrosion, but that’s just not the case with an intelligently fabricated polyethylene product. This material absorbs the impact of the pointed posts and provides a dependable parts-blunting feature that won’t fail. Additionally, an inbuilt UV resistance factor guarantees a material build that won’t degrade or become brittle when the sun’s rays beat down harshly. Coarse REO ends and slim-edged star picket ends are tough to cover. Fortunately, REO safety caps are designed to accommodate many edge types, including star, coarse-rounded, and pointed posts. The tri-edged plastic, the three-sided architecture that’s built into the underside of each cap, is made to accommodate all of these edge profiles and more, so solid bonds are assured. Work sites and construction areas are rife with potential hazards. Factory environments are no different. This is why we have health and safety regulations. They protect and support the human factor by finding workable solutions to any potential hazard. REO safety caps are one of those cost-effective solutions, an essential one. They comply with all occupational safety guidelines, remove impalement hazards, and clearly mark each pointed threat with bright colours and intense hues. Reinforcing bars and exposed metal posts need dull-edged plastic covers. Furthermore, these products can’t just be any old piece of pliable material. The material must incorporate the features we’ve listed above. Finally, the caps must fit securely, must advertise their purpose, and absolutely must deliver a material profile that won’t deteriorate, not even when the sun is blasting out the kind of UV rays that would damage most other plastics.